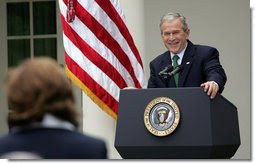 President Bush spoke out about high priced oil's toll on American citizens during a press conference on Tuesday. "Members of Congress have been vocal about foreign governments increasing their oil production; yet Congress has been just as vocal in opposition to efforts to expand our production here at home." Responding to a question about higher food prices, the president told reporters that "85 percent of the world's food prices are caused by weather, increased demand and energy prices". The president also said that surging price of gasoline will spur more investment in ethanol as an alternative energy source. "And the truth of the matter is it's in our national interests that our farmers grow energy, as opposed to us purchasing energy from parts of the world that are unstable or may not like us." Indeed, Mr. President. Oil's high price impact has driven up inflation for food, devastated our domestic aviation industry, impacted small businesses the worst, and just about everything else. Big Oil and Big Food's campaign to destroy the biofuels industry while enriching their own pockets will bring additional misery to millions of Americans. Higher energy costs--with no alternative--means high prices with no end in sight.